Laura Mercier Creme Brulee Sugar Scrub is a polishing scrub with sugar granules and exfoliating beads to gently slough skin as well as clarify and tone. The creamy texture removes dead skin cells from the skin's surface leaving skin feeling soft and silky. Macadamia Nut and Sweet Almond Oils moisturize, Vitamin A & E protect and soothe. Can be used every other day, but mild enough for every day usage. 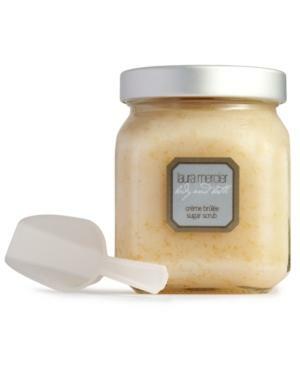 Laura Mercier Creme Brulee Honey Bath/12 Oz.